An additional 550-sheet paper feeder and 1100-sheet high-capacity feeder is available for this printer, enabling less frequent paper refills and easy access to different types of media. An optional 1000-sheet all-in-one finisher including a 50-sheet multi-position stapler and stacker is available, which can help expand compilation of printed materials. It also supports great quality off set and envelope printing mode. An optional 1GB memory module is available for this printer. Additional memory may speed the processing of large/complex print files or networked print files. 80GB hard disk is available, which will help support stored, delayed, secure and proof printing, print spooling, and print collating. 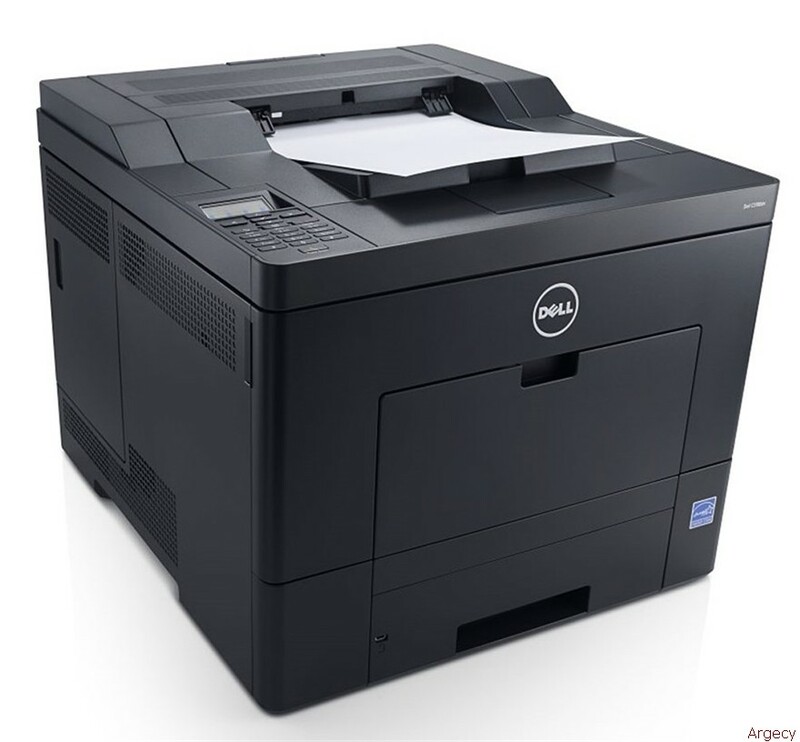 Get crisp and fast color laser printing from the compact 5130cdn Color Laser Printer from Dell. With this printer, you can produce professional-looking documents of up to 600 x 600 (black) and 1200 x 1200 (color) dpi. It lets you print up to 47 ppm (letter) / 45 ppm (A4) in mono and color delivering optimum performance every time you print. Designed to support high printing volumes and great usage demands, the 5130cdn supports 2900-sheet maximum paper input capacity with monthly duty cycle of up to 110,000 pages. It provides effortless setup and installation via USB port. In addition, the built-in 10/100/1000 Base-T Ethernet connectivity equips the printer with enhanced networking capabilities. The Color Laser Printer 5130cdn includes the Dell Toner Management System - an intelligent toner and consumables monitoring program that pro-actively provides alerts when you are low on toner. Dell Printer Web Tool makes it easy to install, configure and manage your network printer and consumables. Dell Color Track 2 enables administrators to control user access and print budget costs by remotely defining color printing rights at the user level, setting print volume limitations and tracking usage over a standard Web browser. Equipped with wide range of features, the 5130cdn Color Laser Printer lets you print vivid, bright and vibrant printouts with ease. The Dell 5130cdn Color Laser Printer slashes printing and waiting time while delivering high-quality laser prints. Fast Warm-Up: The Dell 5130cdn delivers a first-print-out time (FPOT) as fast as 8.5 seconds in mono and 10 seconds in color. Excellent Print Quality: ColorbyDell technology incorporates an innovative print engine, advanced image-enhancement algorithm and advanced toner technology to deliver brilliant color printouts with crisp, clear text. Rich, Glossy Color Images: Advanced EA-Eco Toner emulsion aggregation process saturates paper with superfine toner particles for brilliant color reproduction. Save money in the short term and the long run with the scalable, productivity-boosting Dell 5130cdn Color Laser Printer. Designed to help control print and office expenses, the Dell 5130cdn offers one of the most compelling total costs of printing (TCOP) and costs per page (CPP) in the industry. Dell ColorTrack Pro technology can lower your total cost of printing by remotely defining color-printing rights and setting print-volume limitations. Energy Star 1.1 qualified, the Dell 5130cdn Color Printer reduces power consumption up to 31% compared to the previous-generation Dell 5110cn with the new EA-Eco Toners. From setup and printer management through toner replacement and maintenance, the Dell 5130cdn Color Laser Printer is designed to make life easier for IT staff as well as for end users. Setup Navigator: Get easy setup with animated guidance on features ranging from wireless configuration to troubleshooting. Remote Printer Management: The Dell Printer Configuration Web Tool lets you manage the 5130cdn printer remotely using a Web browser. ColorTrack Pro: This advanced yet easy color-printing access and management tool allows shareable external-server authentication. Easy Toner Maintenance & Purchase: The Dell Toner Management SystemTM alerts you when you're low on toner and streamlines the process of ordering replacement toner. Intuitive User Controls:Thoughtful design features include an LCD panel, 5-way cursor keypads, three user buttons, and dedicated wrinkle-free envelope-printing mode. Designed for durability, and backed by several levels of Dell protection, the Dell 5130cdn Color Laser Printer can meet the most demanding printing requirements, day in and day out. High Productivity: Maximum monthly duty cycle of up to 110,000 pages. High-Yield Toner Options: High capacity of 18k* (mono) and 12k * (color) for longer service between toner changes. Comprehensive Service & Protection: Get help virtually anytime during the standard service and limited hardware warranty* periods. Includes toll-free 24x7 Tech Support and 1-Year Next-Business-Day On-site Service* After Remote Diagnosis *. Up to 5-year extended service options and Dell ProSupportTM* service options available. Fuser kit is included in base and extended limited hardware warranty. (Russia); SASO (Saudi Arabia); SABS (South Africa); UL/cUL listed (UL60950-1 US/Canada); FDA/DHHS (21CFR, Chapter 1, Subchapter J, Class-1 Laser, US); NOM (Mexico); Other safety approvals required by individual countries. Dimensions (W x D x H) 22.05-x19.88-x5.28-; Weight: 23.76 lbs. Shipping Dimensions (W x D x H): 23.43-x27.32-x9.73-; Shipping Weight: 29.04 lbs. Dimensions (W by D by H) 29.13- x 26.97- x 13.82-; Weight: 70.4 lbs. Shipping Dimensions (W by D by H): 31.5- x 33.15- x 19.60-; Shipping Weight: 87.56 lbs. Shipping Dimensions (W x D x H): 16.38-x17.64-x16.73-; Shipping Weight: 0.99 lbs. Dimensions (W x D x H) 2.17-x5.35-x7.40-; Weight: 0.352 lbs. Shipping Dimensions (W x D x H): 12.05-x15.98-x10.71-; Shipping Weight: 0.352 lbs. Color Cartridges (6,000-page yield) 1 , Placemat, Quick Reference Guide (DAO hard copy, EMEA no hard copy), and hardware recycle program label and instructions. 1 Black and color toner yield based on testing in accordance with ISO/IEC 19798. Yields vary with usage and environmental conditions. 2 PC must have a wireless card or be connected to a wireless network, and have the printer software installed for proper function. 5 For a copy of limited hardware warranty, write Dell USA L.P., Attn: warranties, One Dell Way, Round Rock, TX 78682, or visit dell.com/warranty. 6 Remote Diagnosis is determination by online/phone technician of cause of issue; may involve customer access to inside of unit and multiple or extended sessions.